Wooler is perfectly located for easy access to the Northumberland National Park and acts as one of the County's many gateway Towns. The simply stunning Harthope Valley, which has been a family favourite for decades, is just a short distance away and there are a huge number of walks to enjoy in the Cheviot hills. Wooler's community website lists some of the most popular walks in the area and Cheviot Walks is an incredible free resource for everything to do with walking in the Cheviots. Start at the Heatherslaw Cornmill where there is a visitor centre (with a lovely short video explaining the areas history) with lots of information along with the cornmill musem and gift shop. There are also public toilets here and the starting point of the Heatherslaw Light Railway. You can hire cycles from the Visitor Centre here through Heatherslaw Cycle Hire. The only working water-driven Cornmill in Northumberland is on the banks of the River Till. The Cornmill has been lovingly converted into a museum to show the whole milling process from field to flour. There is also a gift shop and Tearoom inside the mill building where you can buy a range of local bread, freshly baked cakes and gifts. In the Tearoom you can get a taste of the flour you've seen in the Cornmill with freshly baked scones and cakes. Postcode for your SatNav: TD12 4TJ. Heatherslaw Bakery is the bakery that is attached to the Cornmill, they produce fine hand baked biscuits, cakes and bread with the produce of the mill. 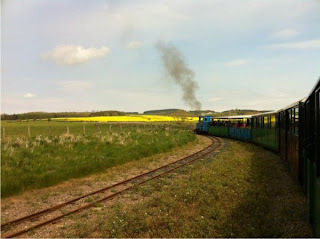 Heatherslaw Light Railway is a firm family favourite and extremely popular with the kids. The railway runs from just opposite the Cornmill to Etal Village and takes about 20 minutes to travel through some beautiful countryside along the river Till. On arrival we especially like watching Lady Augusta or Bunty (depending on which locomotive you have boarded) turning on the ingenious turnstile! Once you have alighted the railway you enter the Village of Etal via the ruins of Etal Castle, and English Heritage site built by Robert Manners as a defence against the Scots Raiders in 1513. The Castle has an award-winning exhibition telling the gory story of the border wars and the history of the Castle. 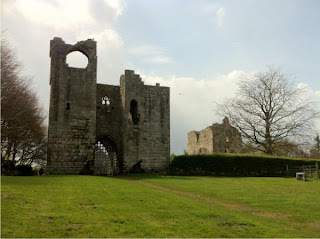 The Village of Etal itself is very attractive and can be explored on foot from the Castle. With many thatched Cottages, a Village Tearoom and Northumberland's only thatched pub there is plenty to explore. Still part of the Ford and Etal Estate, the beautiful Village of Ford is dominated by its Castle. unfortunately the Castle is not open to the public, but you can still enjoy a walk around the Village and a visit to the Lady Waterford Hall. The Hall is an old school gallery with an extremely impresive interior showing off a range of 19th century wall art, a small gift shop and a picnic area nearby. Commissioned by Louisa Anne, Marchioness of Waterford in 1860 the hall is now used for a variety of reasons including the Village Hall and is also available for private hire. 2013 marks the 500th Anniversary of the Battle of Flodden. Over 15,000 Scots and Englishmen, 100 noble men and King James IV died in this battle that shaped a nation. The Flodden 1513 Ecomuseum connects many sites across the borders, for more information and a visitors guide visit the Flodden 1513 website. Located it Milfield just North of Wooler, the Maelmin Heritage Trail covers the life of the Cheviot Hills. The short walk takes in reconstructions of a stone age wooden henge, a stone age hut and a dark age house. The Trail Guide can be bought from the Maelmin Country Store in Milfield and for more information visit the Maelmin Heritage Trail website. The Northern version of Stonehenge, the Duddo Standing Stones are about 2 miles North of Etal, near the hamlet of Duddo (surprisingly!). To get there you need to turn left at Duddo and look for a sign on right. Park here and follow the path to the Standing Stones, it's about a 10-15 minute walk at the most. The Wooler area and the Cheviot hills offer some of the most spectacular cycle paths in the County with stunning views guranteed. Wooler Cycle Hub has seven spectacular routes for you to discover over 8,000 years of local history. The routes are titled: Border Raid, Valley of the Sentinels, Ford & Castle Explorer, on Saintly Paths, The Cross & the Swords, A Corner in Time and Broadstruther Bash. To download the routes in GPX format visit the Visit Northumberland Cycle Hub website. The Wooler Wheel is a 100km Cyle Challenge that takes place in October. Starting and finishing in Wooler the route takes in North Northumberland and the Glendale region and some challenging climbs. For more information visit their website or download a pdf of all seven routes. Cycles can be hired from Hatherslaw Cycle Hire who can be contacted on 01890 820 338 or email tourism@ford-and-etal.co.uk. The nearest golf course is Wooler Golf Club right in Wooler itself and is a nine hole, 18 tee, par 72 course. Other courses nearby include Magdalene Fields Golf Club and Goswick Links in Berwick, Belford Golf Club, Bamburgh Castle Golf Club, Seahouses Golf Club and Dunstanburgh Castle Golf Club. For a full list of clubs in Northumberland visit our golf page. The beautiful River Till, the only tributary to the River Tweed runs through the Ford and Etal Estate. For more information about where you can fish and the best locations please visit the Ford and Etal Estates website. Holy Island's Attractions, Lindisfarne Castle, Lindisfarne Priory, Seahouses Attractions, Bamburgh's Attractions, Bamburgh Castle, Alnwick's Attractions, Farne Island Trips, Dunstanburgh Castle.